"The Flying Pig" answered Vandelay when queried about eats. Oh, the one in Gastown right? "No, the one in Yaletown". Okay, we're not talking about The Greedy Pig... So they serve pork and ribs and such yah? Nope. Nothing could be further from the truth. In fact, there was only one pork dish on the menu if I recall. Then why the name? Well, the proprietors, John Crook and Erik Heck believe that much like a flying pig, they want the impossible to be possible. In this case, employing seasonal ingredients in a simple, yet focused menu all prepared in a open kitchen. That sounded good to Rich Guy and myself, so we m et up with Vandelay for lunch. We started with a few appies including the Devilled Jumbo Chicken Drumettes. These were actually chicken drumsticks that had been baked until the meat fell off the bone. The meat was a bit too cooked for our tastes, which ended up to be slightly dry. The srirracha BBQ glaze was sweet with a hint of spice and smokiness. The srirracha content was modest which suited us fine really because too much and it overwhelms everything. We found the side of Parmesan basil sour cream di p to be fantastic. It was flavourful and had a cooling effect on the meat and went really well with the crisp celery sticks. Our other appie was one of the featured items (which sold out shortly after we ordered it) being the Quadra Island Honey Mussels in a lamb sausage and spinach broth. 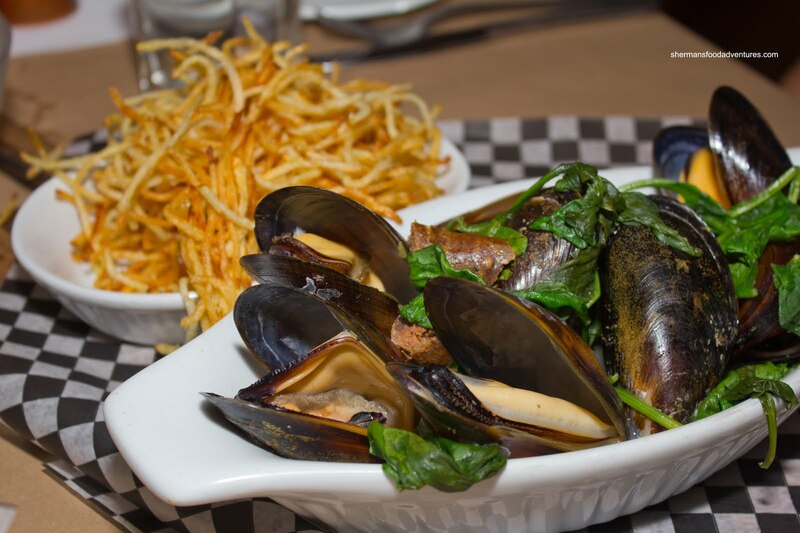 We really liked the large plump mussels. They were fresh and naturally sweet. However, the broth was pretty one-dimensional exhibiting a predominant white wine flavour. The broth could've benefited from more influence from the slightly spicy lamb sausage. The accompanying matchstick frites were reminiscent of Hickory Stix, which were fun to eat, if not a bit clumsy. 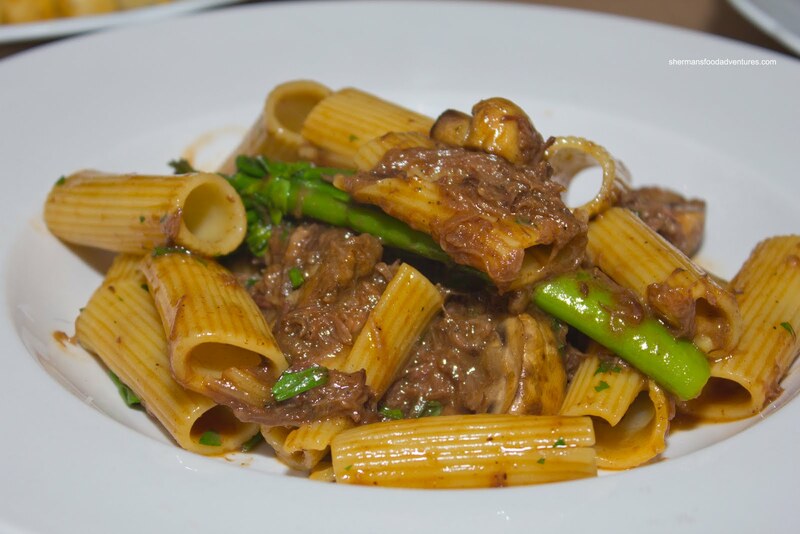 For my main, I went for the Shortrib Rigatoni with Cabernet mushroom cream. This was very well-executed dish. The pasta exhibited an al dente bite that was perfectly firm. It was bathed in a rich meaty sauce that had loads of depth. There was only subtle red wine presence which allowed the natural meat flavour and Earthiness of the mushrooms to be at the forefront. The super tender shortrib required very little effort to eat and was not in the least stringy. Add in the vibrant and crisp broccolini, th is was indeed as perfect as a pasta dish could be. 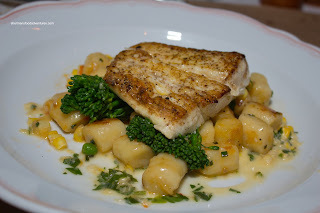 Rich Guy went for the Pan Seared Queen Charlotte Halibut with crispy gnocchi and Chilliwack corn nage. The halibut had a nice crispy sear on the outside and was actually quite flavourful. The flesh was on the drier side, but that is almost unavoidable with halibut. As for the gnocchi, it was slightly dense, yet that didn't bother me since I prefer it over the really fluffy kind. For me, it had a nice bite and a great crispy exterior. However, what brought this dish all together was the sweet creamy corn nage. It was delicately sweet which really complimented the gnocchi and the fish. Vandelay also had fish with the featured Arctic Char. 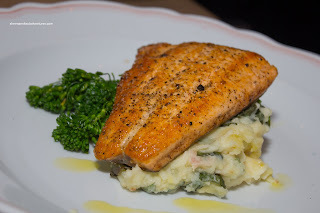 It was accompanied by mash potatoes and broccolini. For me, I found the fish to be slightly past perfectly cooked. However, Vandelay didn't mind it and in the end, it was still moist (personally, I just like my fish a little rare). It was decently seasoned with a beautiful sear. I really liked the mash potatoes because it actually tasted like potatoes with random soft chunks. It wasn't too creamy nor buttery which was good. The broccolini was perfectly cooked and vibrant in appearance. And then at the end of the meal, I pulled a Mijune and couldn't resist dessert. I decided to go for their TFP Drumstick, which serves to emulate the popular ice cream cone found in supermarkets. 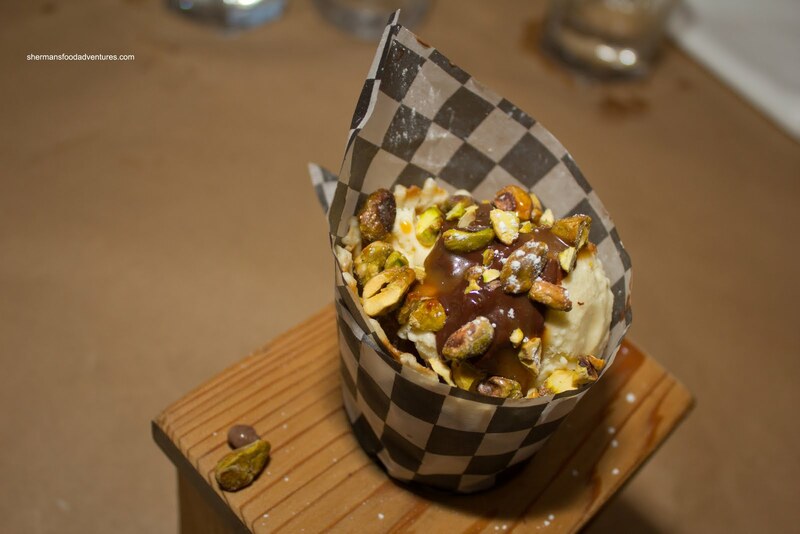 Predictably, theirs was far superior with a freshly made crisp waffle cone, chocolate and vanilla ice cream, chocolate sauce, caramel and pistachios. I really liked the combination of crunchy pistachios, smooth ice cream and light waffle cone. 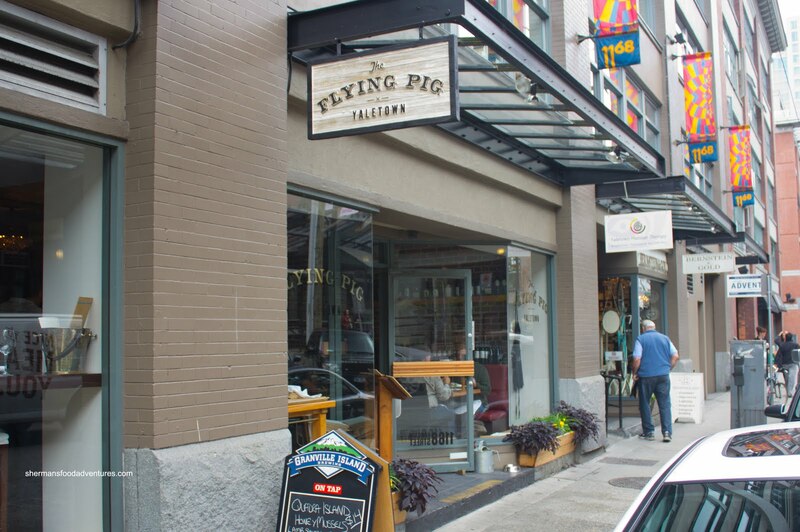 In fact, all of us enjoyed our meal at The Flying Pig. Reasonably-priced given its location and good food to boot too. 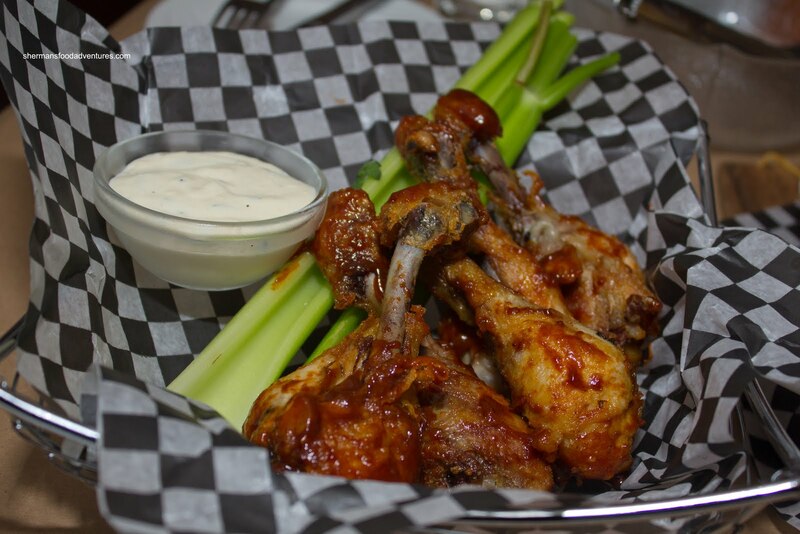 For a while, I have been borderline confusing drumettes (as listed in the menu) with drumsticks. Nowadays, size-wise, they are about the same! And then at the end of the meal, I pulled a Mijune and couldn't resist dessert. @KimHo Yah, especially in the states. In San Diego, I could't believe the size of the food! Mijune is a good influence!